Who Uses Website Translations, And For What Purpose? Maintaining your HVAC equipment not only ensures that it performs efficiently, but it also prevent it from wearing out quickly thus increasing the chances of a longer working period. This is particular important since wearing out of all working equipment is inevitable, however regular breakdowns can be avoided by ensuring that the equipment is properly maintained. One of the equipments that require good maintenance is the heating, ventilation and air conditioning (HVAC) system. This is because proper HVAC maintenance ensure the home in which it is used in is always properly air conditioned as there are lesser chances of a breakdown. One of the ideal HVAC maintenance measures includes ensuring that the filter is clean always. This is because the filter usually accumulates a lot of dust and other impurities which are trapped and prevented from entering the interior of the HVAC. If the impurities accumulates for a long time without being cleaned, dust mites and other harmful organisms can readily hide there consequently putting the people living in that home at danger of developing respiratory problems. The accumulated impurities can also block fresh air from entering the interiors of the equipment thus making it dysfunctional. Consequently the filter should be cleaned regularly by switching off the HVAC and wiping with a dry piece of cloth. If the filters are too dirty to be cleaned, then they should be replaced so as to save the entire equipment. Another important HVAC maintenance procedure is ensuring that the contractor is always clean and free from intruding organisms. This is because the contractors have high voltage electric plates that attract insects which craw inside the HVAC where they die. These insects interrupt the flow of current thus stopping the HVAC from working. Besides removing the dead insect, the other preferred measure is keeping the insects away from the equipment by using strong insect sides around the areas around the HVAC. This is paramount since it is not possible to cover the entire equipment or keep watch to ensure no insect is going towards the contractor. The condenser coil of the HVAC is another part that is prone to damages subsequently hindering normal drawing of fresh air into the equipment. Some of the most common cause of such damages includes dust, leaves and other unwanted objects which might penetrate to the condenser coil. These foreign and harmful objects should be removed by gently washing the coil using substances such as weak dish soap solution with water. High pressure washers are discouraged from cleaning the coil since they can readily damage the thin fins. The ventilator belt is also another important component that should be emphasized on during HVAC maintenance. This is because if the belt wears out, then the entire equipment cannot work. A normally performing belt is usually relatively quite while the HVAC is working, however if it produces quelling sounds once it is worn out which are an indication that it needs replacement. While replacing the belt it is paramount to know the exact size before buying a new one since different HVAC system uses belts of different sizes. Thus proper HVAC maintenance can ensure it does not break down regularly and it also ha a longer working life. Let’s talk about 30-40% of your electricity bill. That’s how much it costs the average homeowner or commercial building owner to provide proper heating, ventilating, and air-conditioning (HVAC). A good HVAC system is the key to maintaining a comfortable, healthy and interior environment. Through the years, I have been asked by many owners for a strategy to reduce their cost of energy and HVAC. They don’t want to sacrifice the interior environmental conditions, but they do want a point-by-point plan to follow. The interesting thing that often happens is that energy bills are lowered substantially and the HVAC system performance is improved. This is a standard function of any mechanical engineer specializing in energy and HVAC. The information on this page will help homeowners, building owners and building operators make informed decisions about existing HVAC systems or future upgrades. Tighten the building shell and add additional insulation. Adding insulation in existing buildings may not be achievable in some instances, so more consideration should be aimed at the exterior shell, especially windows and doors. Installing energy-efficient windows. This is a big item on some buildings that still have single pane windows. The installation of double pane windows with a thermal break is a great return on investment. Make sure they are ENERGY STAR qualified windows. Tinting or Low-E coatings will even be better. Upgrading lighting systems. The average commercial building has a lighting density of 2-3 watts per square foot which maintains proper lighting levels. This is a significant part of the HVAC load and almost any efforts in this direction will lower the cooling requirement for the building. Accent lighting (sometimes called architectural lighting) are not always energy efficient and should not be considered if you want to reduce energy and HVAC costs. Energy-efficient lighting systems emit less heat into conditioned space than older incandescent technology. If you have a return air plenum instead of return air ductwork, consider light troffers so that some of the heat from the lights is returned to the HVAC system instead of going into the occupied area. Selecting efficient equipment and electronic devices that have a power saver option will reduce the sensible heat gain in the space. Items to consider include copy machines, kitchen equipment, computers and refrigerators. Control ventilation by having your outside air balanced. Most building owners have drawings of the original HVAC system installation. Have the drawings reviewed by a mechanical engineer to confirm your outside air flow rates conform to the latest code requirements. If no drawings are available, your mechanical engineer should still be able to make recommendations for improvement. Addressing these items is your first step to reducing energy and HVAC costs. The second step to achieve energy and HVAC system optimization is knowing your system. Your HVAC system is critical to your interior environment, but it also represents a large component of your utility expenses. While it is beyond the scope of this article to discuss every system, a few recommendations can be addressed. Every HVAC system component has increased in efficiency over the years. If your system is more than 13 years old, it’s time to begin planning for an upgrade to new equipment. Well maintained residential systems have a life expectancy of about 15 years or so but seem to fail at the worse times. Have a replacement plan ready for the day your equipment fails. Commercial systems vary, but if your building is using packaged equipment or split systems, the same lifetime can be expected. For larger commercial systems and industrial applications, the HVAC system may be more complex and require an individual analysis by a mechanical engineer. As I said, HVAC systems vary and no one-size-fits-all analysis works for larger systems. What all these systems have in common is they are normally fueled by electricity. Electricity cost money, so any efforts in the direction of increased efficiency is a plus. Find a qualified consultant you trust. If you are a home owner or small commercial building owner, find a good HVAC company or mechanic to evaluate and maintain your system. 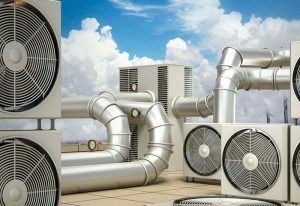 If you are a large commercial building owner, find a commercial HVAC company for normal maintenance and a good mechanical engineer for specific guidance. I do not recommend using a mechanical engineer employed by the HVAC Company; find a third party engineer for unbiased information. Verify your HVAC system load. Home owners should use ACCA’s Manual J calculation method and all others should have a load conducted by a mechanical engineer. Commercial buildings have more requirements related to code conformance, minimum ventilation rates, etc and are individual to each building. Load reduction-Read the information above. Select equipment sized for your load. NEVER OVERSIZE! More-is-better does not apply for HVAC systems. It will cost more to purchase the equipment as well as operate it. Get the load and the equipment selection right the first time. Purchase high efficiency or Energy Star equipment. Many of the new systems include variable speed drives for fans and compressors. Over the years of ownership this will be paid back many times over. Compare standard efficiency equipment to high efficiency equipment in terms of initial cost and life cycle costs. Any good HVAC company or mechanical engineer can obtain this information. Consider some form of energy recovery for any air exhausted from the building and use it to condition the incoming fresh air. This is air you have paid to condition, so extracting some of the energy before exhausting it should be a priority. For large commercial buildings, consider conditioning the outside air with a dedicated outside air unit. This will eliminate any problems related to humidity control in most instances. It will also increase occupant comfort and allow for further downsizing of equipment. Commercial buildings should consider economizers on their equipment. Most current codes require economizers on equipment over 15 tons in size. Often available at a low incremental cost, these units draw in fresh air from the outside when the temperature (sometimes humidity) outside is lower than the temperature inside. Home owners and small commercial building owners should install programmable thermostats. Commercial building owners should install a Direct Digital Control (DDC) system. The investment in either of these will pay back more than the cost in a small amount of time. Read more below. The third step to achieve energy and HVAC system optimization is controlling your system. Programmable Thermostats-The age of digital controls has made saving energy easy. One of the best investments for the homeowner or small commercial building owner is a programmable thermostat. These are simple to use and incorporate strategies based on time scheduling. Most manufacturers offer 7 day programs and setback/setup programs which will turn the HVAC system on and off to compliment your schedule and desired indoor temperature. This is a great way to ensure HVAC systems are used only when necessary. DDC Systems-For the large commercial building, I consider this as a must have system. Installation costs have steadily decreased and the performance reliability has steadily increased. They can be integrated into any system and expanded as required. Some of the more popular features of these systems are optimized start/stop of the HVAC system, multiple zone control, multiple temperature sensor locations and ventilation control. The best part of these systems is their ability to be scaled up to the largest of commercial applications. This means you can install a simple system and add more controls later to incorporate your whole HVAC system. Again, the payback is short and well worth the investment. The fourth and last step to achieve energy and HVAC system optimization is operation and maintenance. The most efficient HVAC systems are well maintained. Ensure reliability, efficiency and a long life for your HVAC system by following these tips. Find a qualified consultant you trust. If you are a home owner or small commercial building owner, find a good HVAC company or mechanic to evaluate and maintain your system. If you are a large commercial building owner, find a commercial HVAC company for normal maintenance. Make sure you record and document all servicing with dates, times and names of the servicing person. Home owners should always get a seasonal tune up. The operation of your system will vary with the seasons of the year. Replace your air filters regularly. Don’t use anything less then a MERV 5 filter to assure dust and fibers are removed. Clean filters will save fan energy. Energy and HVAC optimization will reduce your electricity costs. A little time getting to know your system and familiarizing yourself with improvement strategies will save money and increase the life of your equipment.